After twenty years development of urban informatization and digital city, the concept of Smart city is becoming the next stage of urbanization on a global scale. The data science and technologies, such as big data, data vitalization, and data mining, play pivotal roles in building of Smart City. In this paper, we present a survey about data-centric Smart City technologies from an informatics perspective. This paper first summarizes the variety of urban data used in existing Smart City applications, and analyzes their features. 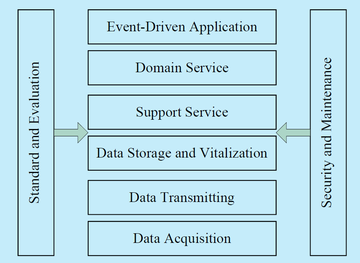 Then, the state-of-the-art progresses in the research of data-centric Smart City are surveyed from three aspects: general architectures, application solutions, and core technologies. Finally, the paper concludes the characteristics of the research on data-centric Smart City and raises some directions for future works. Journal of Computer Research and Development, Vol. 51 (2): 239-259, 2014. Urban development is becoming increasingly reliant on effective use of intelligent services. In the process of providing better services to all citizens and improving the efficiency of administration processes, the concept of a smart city has been lauded as a promising solution for the coming challenge of global urbanization. 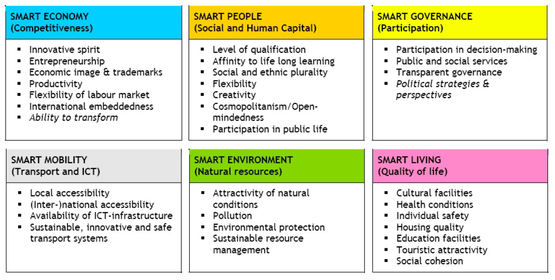 However, due to the broad scope of smart cities their definition has not been standardized, thus proposed architectures are diverse. This work proposes a new architecture from the perspective of the data that underpins all the functionality of smart cities. The proposed architecture is discussed,outlining design challenges and offering insight into the development of smart cities. The architecture proposed by this paper was adopted by the National High Technology Research and Development Program of China (863 Program). China Communications, Vol. 11 (3): 56-69, 2014. Michael Batty; Kay Axhausen; Giannotti Fosca; Alexei Pozdnoukhov; Armando Bazzani; Monica Wachowicz; Georgios Ouzounis; Yuval Portugali. The European Physical Journal Special Topics, Vol. 214(1): 481-518, 2012. Zheng, Yu; Capra, Licia; Wolfson, Ouri; Yang, Hai. Urban computing is an interdisciplinary field where computer sciences meet conventional city-related fields, like transportation, civil engineering, environment, economy, ecology, and sociology, in the context of urban spaces. This article first introduces the concept of urban computing, discussing its general framework and key challenges from the perspective of computer sciences. Secondly, the paper classifies the applications of urban computing into seven categories, consisting of urban planning, transportation, the environment, energy, social, economy, and public safety & security, presenting representative scenarios in each category. 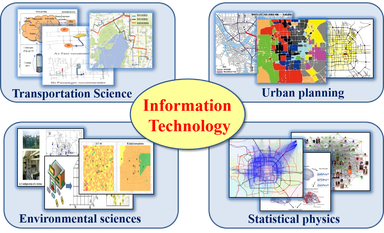 Thirdly, the paper summarizes the typical technologies that are needed in urban computing into four folds, which are about urban sensing, urban data management, knowledge fusion across heterogeneous data, and urban data visualization. Finally, the paper outlooks the future of urban computing, suggesting a few research topics that are somehow missing in the community. ACM Transaction on Intelligent Systems and Technology, Vol. 5(3), 2014. Pablo Samuel Castro; Daqing Zhang; Chao Chen; Shijian Li; Gang Pan. Vehicles equipped with GPS localizers are an important sensory device for examining people’s movements and activities. Taxis equipped with GPS localizers serve the transportation needs of a large number of people driven by diverse needs; their traces can tell us where passengers were picked up and dropped off, which route was taken, and what steps the driver took to find a new passenger. In this article, we provide an exhaustive survey of the work on mining these traces. We first provide a formalization of the data sets, along with an overview of different mechanisms for preprocessing the data. We then classify the existing work into three main categories: social dynamics, traffic dynamics and operational dynamics. Social dynamics refers to the study of the collective behaviour of a city’s population, based on their observed movements; Traffic dynamics studies the resulting flow of themovement through the road network; Operational dynamics refers to the study and analysis of taxi driver’s modus operandi. We discuss the different problems currently being researched, the various approaches proposed, and suggest new avenues of research. Finally, we present a historical overview of the research work in this field and discuss which areas hold most promise for future research. ACM Computing Surveys, Vol. 46(2): 17:1-17:34, 2013. SP6 - Social sensing: A new approach to understanding our socio-economic environments. Liu, Yu; Liu, Xi; Gao, Song; Gong, Li; Kang, Chaogui; Zhi, Ye; Chi, Guanghua; Shi, Li. The emergence of big data brings new opportunities for us to understand our socio-economic environments. We coin the term “social sensing” for such individual-level big geospatial data and the associated analysis methods. The word “sensing” suggests two natures of the data. First, they can be viewed the analogue and complement of remote sensing, since big data well capture socio-economic features for which the conventional remote sensing data do not work well. Second, in social sensing data, each individual plays the role of a sensor. This article connects social sensing with remote sensing and points out the major issues when applying social sensing data and associated analytics. 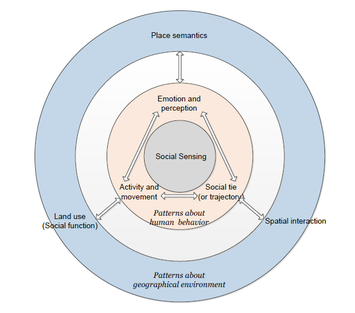 We also suggest that social sensing data contain rich information about spatial interactions and place semantics, which go beyond the scope of traditional remote sensing data. In the coming big data era, GIScientists should investigate theories in using social sensing data, such as data representativeness and quality, and develop new tools to deal with social sensing data. Annals of the Association of American Geographers, in press. Long, Ying; Wu, Kang; Wang, Jianghao; Shen, Zhenjiang. This paper propose the concept of big model as a novel research paradigm for regional and urban studies. 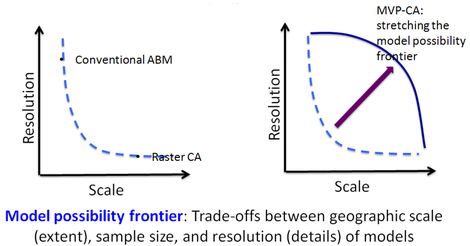 Big models are fine-scale regional/urban simulation models for a large geographical area, and they overcome the trade-off between simulated scale and spatial unit by tackling both of them at the same time enabled by emerging big/open data, increasing computation power and matured regional/urban modeling methods. The concept, characteristics, and potential applications of big models have been elaborated. We addresse several case studies to illustrate the progress of research and utilization on big models, including mapping urban areas for all Chinese cities, performing parcel-level urban simulation, and several ongoing research projects. Most of these applications can be adopted across the country, and all of them are focusing on a fine-scale level, such as a parcel, a block, or a township (sub-district), which is not the same with the existing studies using conventional models that are only suitable for a certain single or two cities or regions, or for a larger area but have to significantly sacrifice the data resolution. It is expected that big models will mark a promising new era for the urban and regional study in the age of big data. 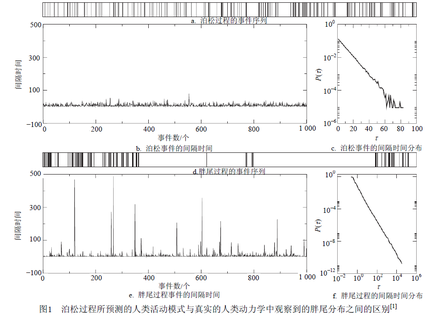 Working papers of Beijing City Lab, WP41. Zhou, Tao; Han, Xiao-pu; YAN, Xiao-yong; Yang Zi-mo; Zhao Zhi-dan; Wang Bing-hong. Quantitative analysis on human behavior, especially mining and modeling temporal and spatial regularities, is a common focus of statistical physics and complexity sciences. The in-depth understanding of human behavior helps in explaining many complex socio-economic phenomena, and in finding applications in public opinion monitoring, disease control, transportation system design, calling center services, information recommendation, and so on. This review article summarizes the state-of-the-art progresses of human dynamics, including the empirical analysis and modeling on human temporal activities, the empirical analysis and modeling on human mobility patterns, and the applications of human dynamics. Furthermore, this article reviews the advanced and insufficient points of related works, and points out some unsolved challenges in both theoretical and practical aspects. Journal of University of Electronic Science and Technology of China, Vol. 42(4): 481-540, 2013.